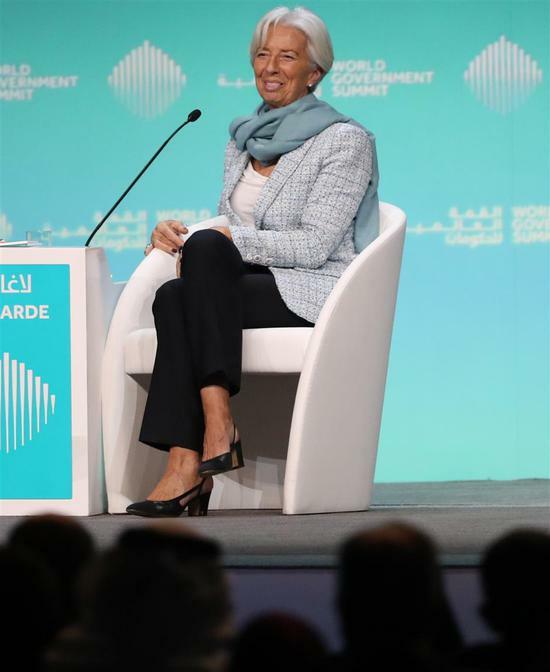 Christine Lagarde, managing director and chairwoman of the International Monetary Fund, speaks during the opening session of the World Government Summit in Dubai yesterday. The International Monetary Fund yesterday warned governments to gear up for a possible economic storm as growth undershoots expectations. “The bottom line — we see an economy that is growing more slowly than we had anticipated,” IMF Managing Director Christine Lagarde told the World Government Summit in Dubai. The clubby annual event brings world leaders together at a luxury hotel in Dubai for motivational talks littered with business buzzwords. But this year’s summit comes amid a worldwide turn toward populism and away from globalization. Last month, the IMF lowered its global economic growth forecast for this year from 3.7 percent to 3.5 percent. The risks include “trade tensions and tariff escalations, financial tightening, uncertainty related to (the) Brexit outcome and spillover impact and an accelerated slowdown of the Chinese economy,” she said. Lagarde said trade tensions are already having a global impact. “When there are too many clouds, it takes one lightning (bolt) to start the storm,” she said. Lagarde also warned yesterday that the British exit from the European Union means it “will never be as good as it is now” for the country’s economy. Lagarde didn’t hesitate to criticize Britain’s upcoming departure from the EU. Britain is due to leave the EU on March 29. UK businesses fear a possible “no-deal” Brexit with the EU will cause economic chaos by imposing tariffs, customs and other barriers between Britain and mainland Europe. “I’m certain of one thing, is that it’s not going to be as good as if they had not been Brexit, that is for sure,” she said. “Whether it ends well, whether there is a smooth exit given by customs unions as predicated by some, or whether it’s as a result of a brutal exit on March 29 without extension of notice, it’s not going to be as good as it is now.” She urged all parties to “get ready” as it will upend how trade is conducted with Britain.